My first album, a very experimental and eclectic mix of electronic music from various subgenres, everything from 80s dance to alternative to modern techno. The project sort of grew organically out of my attempts to emulate two of my favorite bands: Cocteau Twins and Underworld. You can listen to songs by clicking on the track title below, or you can download the entire album available as a zipped folder. 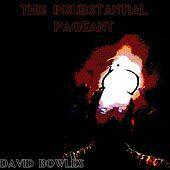 Lyrics from This Insubstantial Pageant.